The program consists of interactive workshops and presentations by mediators, collaborative lawyers and mental health professionals that are interested in developing innovative tools to assist with conflict resolution in a Family Law context. 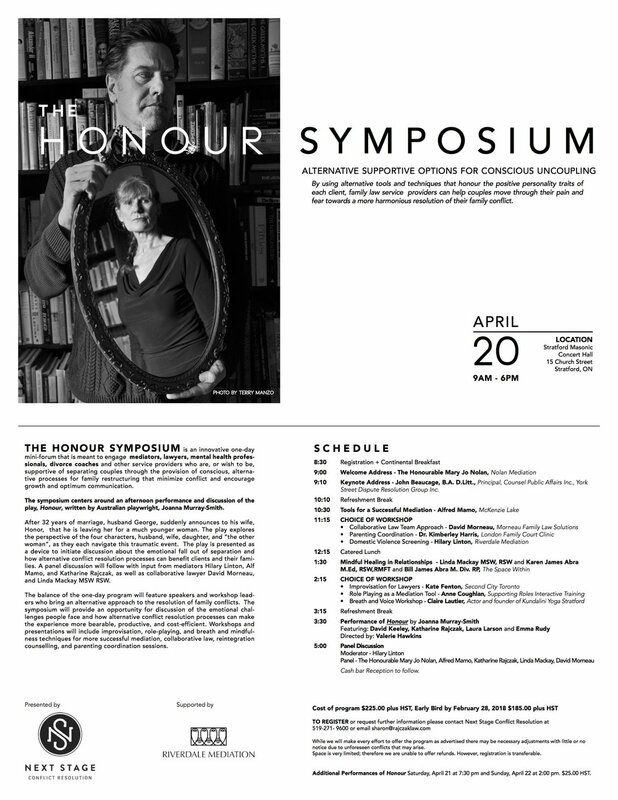 In addition to role-play and discussion-oriented workshops, the primary focus of the day will be the presentation of a play called Honour, by acclaimed Australian playwright, Joanna Murray-Smith. The play deals with the emotional fallout that results from the abrupt breakdown of the couple's 32-year marriage. A panel discussion will follow the play in which mediators, actors and audience will engage in a discussion about the difficult issues families face when a relationship breaks down and how service providers may assist outside of a courtroom setting. The participants in the symposium will be members of interdisciplinary associations of professionals dedicated to exploring innovative ways to address the needs of families and children in conflict. Conflict is exacerbated by emotion, particularly the often uncontrolled, highly charged emotion that ensues from what is one of the most stressful and painful situations that a family or individual may experience in their lifetime. Clients often bring anger, guilt, resentment or profound sadness into a meeting with their advisor, advocate, or support person, or before a decision-maker who has the power to drastically affect their lives; the effect of parties' emotions affect the mediation or collaborative process but can also take a toll on the professionals involved in the matter. The equilibrium of the professionals consigned to help and serve clients may be affected by the emotional energy emanating from any one of the participants in the situation; this can compromise the professional’s ability to function effectively in the negotiations or court proceedings. Authentic communication is key in empowering families to cope with, and resolve conflict. A grounded presence is crucial to effective advocacy, whether in court or when navigating the confines of other institutional settings on behalf of a client. Interactive workshops offered include role playing, improvisation, and holistic breathing and voice techniques in which participants will learn tools that will assist them to cope in stressful environments so they perform and communicate better in various conflict resolution forums, but also in more intimate settings with clients. In the inevitable ups and downs of a case, a calm and confident presence can only have a positive and steadying effect on the families we are trying to serve.